It’s reassuring to know that a room can just fall into place, with no predetermined theme, rhyme or reason – it just works. 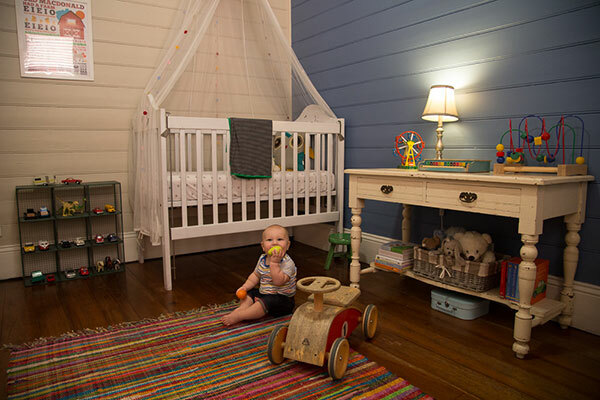 Click through to see Eli’s nursery, a space that blends treasured new and vintage finds with gifts from friends and family. 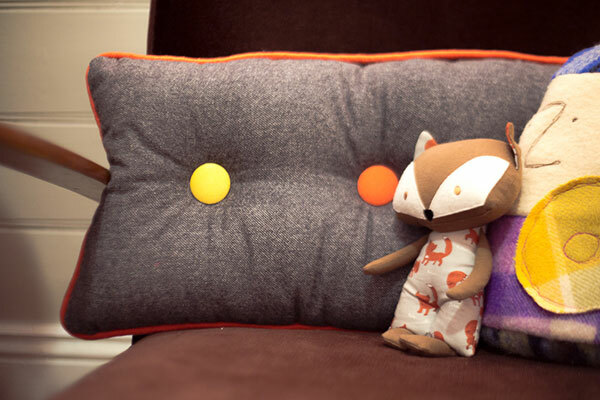 The eclectic mix has delivered a fun space, perfect for this gorgeous little lad. 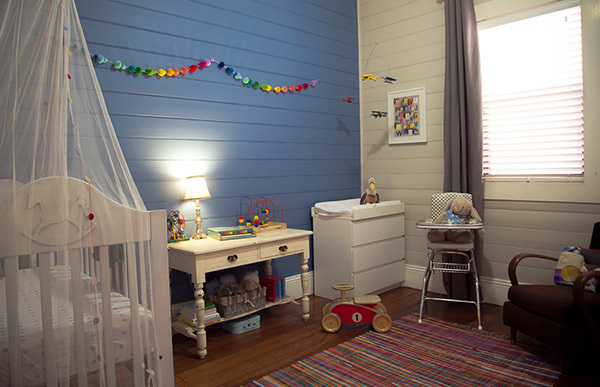 Eli’s mum Libby says on decorating the space : The room came together pretty quickly as a result of using hand-me-downs and secondhand finds – we just used what we had or were given. Because we were using older pieces I wanted to use bright colours to liven up the space a bit more. It suits Eli’s personality perfectly. He is fun, active and into everything! Now that he is walking I will probably change his room again to make it more a toddler’s play space. We love the contrast between the bold blue feature wall and the white furniture, not only does it make the room pop with a fresh and serene vibe (excellent for little boys), it reflects sunlight beautifully as it cascades through the large window. 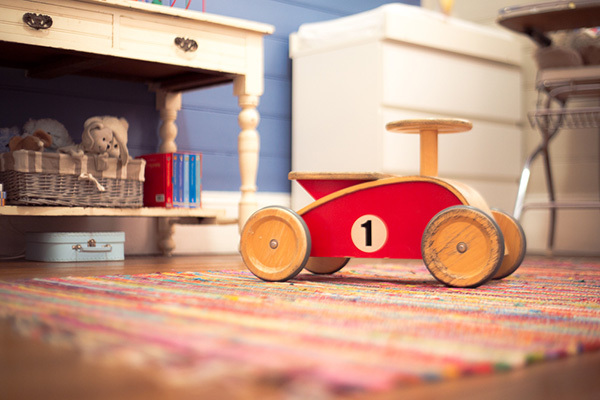 Pops of colour are found in every direction, be it through the sublime striped rug, the felt garland and embellishments on furniture and toys, it all melds together without fuss. 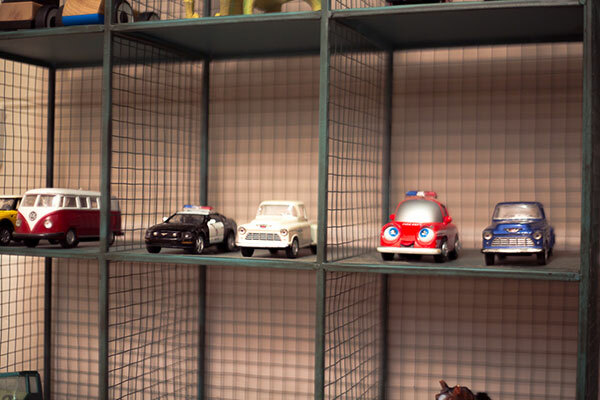 Libby has cleverly added some great metal decorating accents, giving an injection of texture and industrial style boyish charm to the space – I absolutely adore the wire storage unit currently housing some of Eli’s car and toy collection, it’s a piece that he’ll be able to use throughout his childhood with endless options for storage. 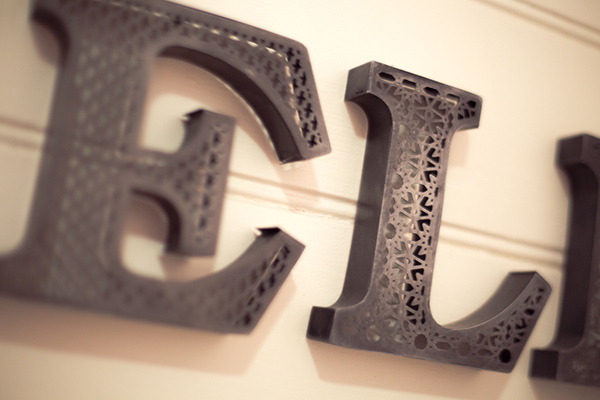 I’ll be quick to snap up some of these acid etched letters for myself, a fabulous internet find and the perfect choice for adding a personal touch to the nursery. 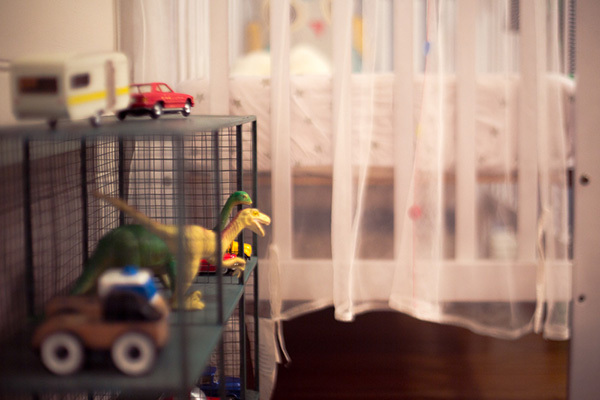 Eli, you’re room is an absolutely delightful space and we have no doubt as you get older many afternoons will be spent with toys sprawled all over your rainbow striped rug!